Just recently completed, this new home also has all new furnishing! This fabulous, single level, 3 bedroom, 2 bath house is great for everyone! The open floor plan combines the dining, kitchen, and living room with large windows and plenty of natural light. The dining area is designed to accommodate groups of six around the table and four more at the breakfast bar. The kitchen is well equipped kitchen is stocked with dinnerware for twelve, a blender, food processor, immersion blender, toaster, toaster oven and Keurig coffee machine. The living room includes a 75" satelitle TV and a BluRay/DVD player. The spacious master bedroom looks in to the back yard and features a king bed, large bathroom with a walk in, tiled shower and dual vanities. The house is complete with a bedroom with a queen bed and another bedroom with two twin mattresses. A highchair, pack-n-play and stroller are always available for guests to utilize. Located just off of S. 19th, you will have quick access to Hyalite recreational area and numerous trailheads south of Bozeman. The two car garage leaves plenty of room for toys whether it be bikes, boats, or skis! ABOUT THE OWNERS...and why they chose this house. 'We’re happy to return to Montana and own this beautiful and happy home in Bozeman. Blessings abound—family members and friends live practically next door; the air is clean and the scenery is breathtaking. Life is good in Bozeman. Because our house was purchased with friend and family gatherings in mind, the open living area is ideal. Kitchen counters are large enough so several people can cook together. Counter stools and the dining table provide seating for at least 10 people comfortably. The little game table and chairs off the kitchen will easily accommodate two more if not in use for cribbage or other games. Because we have young grandchildren, we avoided square edges whenever possible, as our goal was comfort and safety for all ages. The house is located a couple of miles southwest of the Montana State University campus where several family members are alumni. Reed’s Mom returned for her 50th anniversary graduation. Anita and several of her siblings are also alumni. Our roots are in rural Montana and Bozeman. Very prompt to return our phone call for clarification on directions. Beautifully furnished house with a fully operational kitchen. The house was bright and we had everything we needed for a relaxing weekend. Jody is always amazing. We always rent from her and once again, she was exceptional in her service and professionalism. Thanks again. We'll be back in December! Comfortable, Convenient, Well Stocked Home! 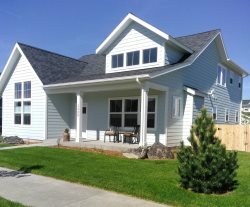 This was a great stay in Bozeman and this home is absolutely perfect! The owners really have thought of everything in terms of amenities and convenience items! Wow! And not dollar store junk like many short-term rental homes; this property is equipped with good quality items - from the furniture to the TVs to the linens to the coffee cups! The home was quiet even though there is still new construction going on in the neighborhood - we were never once bothered by any level of noise. The home has a great layout for when we had some friends visit for dinner and, again, more than ample supplies in the kitchen to handle 10+ people. If we're back in Bozeman, we'll definitely be rebooking this property. Jody was very responsive and helpful throughout the entire process from booking to check-out. We stayed in Bozeman during the MSU spring break to spend time with our son and to enjoy some spring skiing. The house was perfect for the entire family to hang out together. Really large screen television which made the sons happy and a great kitchen to cook in which made the parents happy. The washer and dryer are fantastic if you are doing a ski vacation. A very beautiful and surprisingly spacious home which made our time together even more enjoyable. I would highly recommend this vacation rental.